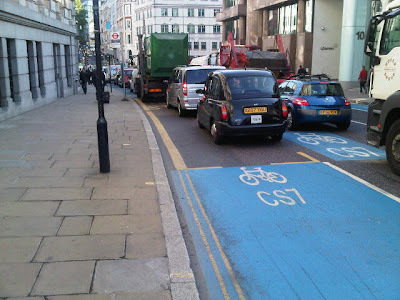 Cyclists in the City: Bloody cyclists! Tough luck if you get killed. Essentially, today's Conservative position on cycle safety. Do we want political party that supports laissez-faire on the roads? Your fault if you get killed? Bloody cyclists! Tough luck if you get killed. Essentially, today's Conservative position on cycle safety. Do we want political party that supports laissez-faire on the roads? Your fault if you get killed? policy is why that bloody cyclist is in your way. Totally insane. Pictured left, a cyclist in the middle of the road. The road in question is Queen Victoria Street, just off the Blackfriars northern junction. Bloody cyclist! Why's he in the middle of the road? Well, that's because the junction has been designed that way. Just ahead of the cyclist, the road narrows significantly. So he has no other choice. The taxi driver right behind him must be getting royally pi88ed off that he can't get past. That's because he's also had to sit behind the bike all the way through the junction. Again, because of the way the junction is designed. Understandable, frankly. I wrote yesterday about the removal of the key pedestrian crossing at Blackfriars (an issue I first addressed in February 2011 here) Earlier today, Labour Assembly Member John Biggs issued a press release saying he would write to TfL to ask why they had committed such a 'monumental error' in removing the crossing. Transport for All, a charity that campaigns on behalf of older and disabled Londoners has also chipped in, stating on twitter: "Disabled ppl esp visually impaired ppl will be put in danger by Blackfriars pedestrian crossing removal"
What gets me about all of this is that the politicians are siding in two completely opposing camps. After one of their Assembly Members (Brian Coleman) walked out, the Conservatives did actually stick around today for a debate at the London Assembly that agreed a motion (introduced by Jenny Jones of the Green Party with strong support from Labour and LibDems) to review dangerous junctions for cycling in London. While that's all well and good, I don't feel too confident it means very much. The Conservatives actually helped structure a very strong motion last summer with the Green Party about Blackfriars Bridge. Six months on, nothing whatsoever has happened. "The conservative line appeared to be that focusing on junctions where people had lost their lives risked was “arbitrary” (Cleverly) relying on “coincidences” (Boff). They felt that the focus should be on “tipper trucks” vehicle design and driver training as they appeared to be responsible for a disproportionate number of cyclist deaths. There seemed to be little explanation as to why reviewing junction safety was incompatible with looking at dangerous heavy vehicles." And that's essentially the problem. The London Conservatives don't seem to think that road design has anything whatsoever to do with London becoming more dangerous for cycling (see Green Party candidate Jenny Jones's excellent analysis on that topic here). They seem to think it's just tough luck. This week, I've now had a number of black cab drivers contact me on twitter saying it's time to make space for cyclists, that we shouldn't be shoved between two HGVs or buses. 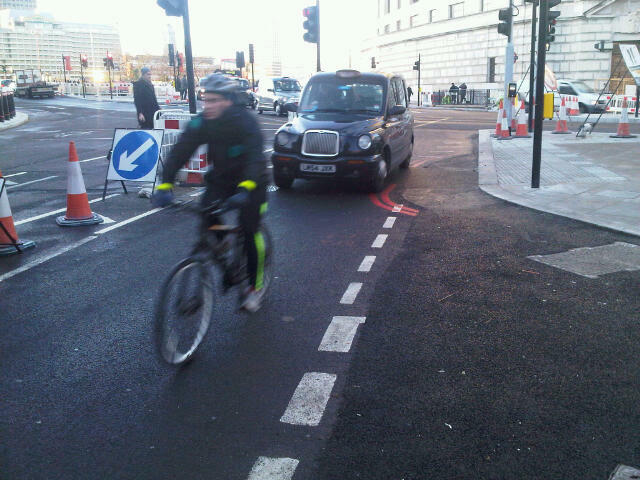 They probably also want us out their way at junctions like Blackfriars above. And good on them, frankly. The road has been designed to wind up that cab driver as much as possible by using the cyclist as a kind of rolling speed hump. It's a travesty of road design. Another 'bike lane' designed under Mayor's 'smoothing traffic' policy. design as it makes you safer on a bike. How exactly? But the London Conservatives are sticking with the line that the Mayor's 'smoothing the traffic flow' policy is a good thing. Andrew Boff, who has otherwise been quite sensible on this stuff, even stood up to state (with no evidence) that it actually made cycling safer. He tweeted later 'smoothing isn't speeding'. No-one's talking about speeding. We're talking about road designs. Like this one on the left. This is a bike lane designed to maximise traffic flow. Problem is the only place to cycle is between the HGVs. Or just not at all, to get off and walk. Smoothing is about stacking traffic into giant queues like this. It's about trying to shove cyclists into the queue along with everyone else. That's the exact same situation at Bow roundabout. It's the same at Kings Cross. There's plenty of space for a bike lane but it's not going to happen, it seems. Transport for London is still safe saying it will only ever look at incremental improvements to junctions where people keep getting killed and not create safe space for cycling. Because it might get in the way of the smoother traffic flow. It's also why TfL is removing pedestrian crossings at Blackfriars and all across London (it hasn't happened yet but I promise you, hundreds are on their way out soon). Pedestrians get in the way of the smooth traffic flow you see. So, the Blackfriars design has now alienated a) cyclists b) pedestrians c) a charity representing older and disabled Londoners d) is starting to get on the nerves of cab drivers too. You start to wonder why the Mayor and his party are sticking to the Blackfriars design, let alone the overall policy. Do most Londoners want to vote for someone who thinks that old people shouldn't be able to cross the road? Or that people who get killed on the streets brought it on themselves, possibly because they didn't have their 'wits about them' (quoting Boris's suggestion that you just need to keep your wits about you and suggesting it's fine to take your kids through Elephant & Castle on a bike, let alone to cross the road here). I've met several of the Conservative London Assembly Members. They're mostly (not all) smart, switched on, and wanting to do good. But they're painting themselves into a corner. Not as the 'nasty party'. It's more like laissez-faire gone mad. Your fault if you get killed. Nothing to do with us. I disagree with laissez-faire on the roads. It kills people. I think deep-down they do too. I hope so. Cabbies are not our friends. They might support cycle infrastructure but only so that if we get it they can bully cyclists off the roads altogether, roads which are actually there for all to share. Black cab drivers basically live in a bubble, with their own ways of reading the road and behaving, and no desire to accommodate others. Non-professional road users are a blight, according to the cabbie mindset. But roads are not the preserve of a professional cadre of drivers. London black cabs need to be gradually phased out almost entirely. They are the reason that using central London roads is as stressful as it is. They are not killers like the HGVs, but they are the dominant influence on London vehicular manners, in a wholly unpleasant and negative way. In my experience that's unfair on the majority of cab drivers who are decent road users, willing to make space for me as a cyclist. While yes, the bad eggs do stand out more than the ones who pass by without a fuss, I am struck sometimes by just how much space many cabbies let me have, especially at junctions. Don't tar all cabbies with the same brush - it's just as wrong as when motorists tar us all with the 'you all jump red lights' brush. On the Tour Du Danger, the only incident that I saw involved a Taxi. The cyclist involved was the guy in the panama hat in this video. From 00.40 at the bottom of the frame, about one third from the left. Despite Jennie Jones' rejection of a design guide as "worse than useless" and being content with the public engagement with cyclists, I will be resubmitting the proposal and hope to persuade her and the other parties that this will result in safer environments for cyclists. Of course junction design on the superhighways can contribute to accidents, that's why we want the major ones to be reviewed, not just 10 of them. As to smoothing, I'm afraid there was, in the debate, confusion between smoothing and speeding. The stops and starts of motorised traffic, apart from being more polluting, makes my cycle journeys less safe but that is, admittedly, just my experience. From the tweets I've seen, other people don't agree with me but I'd like to see some evidence either way. @ Andrew, a far more effective way of reducing the stop-start and thus improving exhaust emissions and making roads safer would be to impose, and enforce, a 20mph speed limit throughout London. There is ample scientific evidence on the safety question. On he pollution question there is less to go on but you could refer to the paper by three researchers at the Flemish Istitute for Technologcal Research which finds that a 30kph limit has no material effect on CO2 or NO emissions (despite claims that cars are more polluting at 20mph than at 30) and has a beneficial effect on PM10 emissions. Of course, your mayor is as resolutely opposed to that as he is to making junctions safe for cyclists and pedestrians. @Andrew - Jenny Jones said it's useless because cyclists recomendatioins are being ignored. What good a consultation is if nothing of it is included in the final design. As with road design for it to work it has to be complete, so even if you incorporate bits and bobs it does naught for cycling. There are numerous ways the current smoothing agenda is damaging to cycling (some are described above). If you want to reduste polution perhaps we should be encouraging modal shift from cars to bikes - much better than trying to push as many cars as possible through junctions. Also reviewing all major routes sounds great but it's watering it's down. Please let's focus on those mentioned and try to track the results. I firmly believe that junctions that introduce two lanes to stack traffic (to reduce the length of the queue) make things much less safe for cyclists. I'm speaking with most experience of commuting from Clapham to the west over towards Kew Bridge, largely on the south circular. Firstly, mostly these roads are single lane until you get close to a junction when there are then two lanes squeezed in. There is usually only just enough space for this, so any cycle lane that may have existed on the single lane approach, disappears just as cars are squeezing alongside each other at the junction. This leaves no way for cyclists to get to the ASLs, rendering them virtually useless unless you happen to be at the head of the queue when the lights change to red. Secondly, these junctions actually increase the level of motorised acceleration and deceleration that Andrew Boff rightly says is dangerous to cyclists (http://bit.ly/ttGfbm). When starting off at the start of the green cycle, the two lanes of cars usually accelerate aggressively, jostling for position as they try to get across the junction. This often leads to drivers pushing aggressively close to the back of cyclists, and trying to squeeze through between the car in the other lane and the cyclist when there just isn't space. This is made worse by the fact that the two lanes normally revert to one lane after the junction. Its even more dangerous as the lights are about to change to red and drivers accelerate to get through them (as might happen on a single carriage way junction), trying to squeeze into space between the other lane and cyclists as the road narrows to one lane again. I realise that a second lane is often needed to enable a right turn, and how that is managed is an issue in itself, but to suggest that these junctions reduce the amount of motorised acceleration and deceleration is, in my experience, completely incorrect. They take away any protection a cyclist had from the previous cycle lane and lead to drivers accelerating and jostling for position when there really isn't space. Agree with Paul M - nice thing about 20mph is that it reduces motorist's expectations of going faster than that - making them (hopefully, at least) less impatient to squeeze past cyclists riding at 15-20 & more tolerant of people riding in primary. I don't dare hope that 20mph limits will do much to get the over-65's or under-14's out on their bikes - that will need infrastructure - but it will make life better for those already riding. Would it be too much to ask, I wonder, that blanket 20mph, on all roads inc. TfL controlled, & with actual enforcement, be brought in for trial periods in a few boroughs? AFAICS, the only way to get the evidence is to try it - it certainly can't make things any worse. (Westow St headed North on to Gipsy Hill, if the link doesn't work). Doesn't look so bad with only cars there, but with buses and trucks it's a 'mare; vehicles going straight on from the left lane will undertake & the lane also assumes that those in the right-turning lane actually turn right instead of going straight on. Crap junction for pedestrians too - there's an east/west crossing by the cycle ASL, but no north/south on either side - peds have to chance their luck basically. Usual excuses - making life less unpleasant for anybody not in a vehicle would "cause unacceptable delays". It is all well and good producing yet another design manual, but it is the behaviour of local authorities that needs to change otherwise they will continue to ignore them (as they do at present with current design guidance). Given the attitude of Richmond council towards groups campaigning towards safer roads - namely cutting them out of consultation - it is hard to see how what Andrew is proposing will make any difference. "Sometimes campaigning to improve safety is counter productive." "Can we please have RCC encouraging people to cycle not putting them off. It would be better for everyone." I think that people are put off cycling for safety concerns themselves, without campaign groups causing them to be put off. I would tend to support you on the design guide. the london cycle safety standards don't rule out the kind of multi-lane junction that cyclists now have to make their way through at Blackfriars, and they should. A new set of standards should give much more weight to protected space and cycle signals at junctions and on busy roads. 'Smoothing the traffic flow' is a disaster mostly, as uninspired ramblings pointed out, because it's essentially two things - increasing motor traffic capacity at junctions, which squeezes out cycle and pedestrian traffic, and removes any protected space that might have been there - and changing timings at (or removing) pelican crossings - and if you give time to one user group you take it away from another - so pedestrians wait longer to cross, or have less time to cross, or have to walk much further to cross. The brochure for 'smoothing the traffic flow' also sets out a policy of encouraging modal switch. Unfortunately, there are no suggestions at all of ways to enact this policy - presumably because it's not possible while one is also increasing motor traffic capacity. TFL, by the way, has an excellent paper on the safety and economic benefits of 20mph.